What is a Declared Public Precinct? A Declared Public Precinct is a strictly defined area that has been proclaimed to give certain powers to police to maintain public safety and order in that area. Where are the Declared Public Precincts? Where is the Declared Public Precinct? The stated geographical area has been described as ‘City West’ for ease of reference. When is the Declared Public Precinct operational? 6pm to 6am each Friday and Saturday. The Declared Public Precinct will commence from 6pm on Friday, 16 November 2018 until declared otherwise or until 6am on Sunday, 17 November 2019, whichever occurs sooner. remove children from the declared public precinct who are in danger of physical harm or abuse, behaving in an offensive or disorderly manner, or otherwise committing or about to commit an offence. These powers give police the ability to issues expiation notices for offences within the geographic area or to issue barring orders covering the precinct. These are similar to, but in addition to, licensed premises barring orders. If you are subject to any of the above, you are legally required to comply with the officer’s direction. What are the maximum penalties involved? A person who is barred, but enters or remains, in the Declared Public Precinct is guilty of an offence which carries a maximum penalty of $2500. A person who is ordered to leave, but remains, re-enters, or attempts to re-enter, the Declared Public Precinct is guilty of an offence which carries a maximum penalty of $1250. A person who behaves in an offensive or disorderly manner within a Declared Public Precinct faces a maximum penalty of $1250. (Expiation fee $250 + $60 Victim of Crime Levy). A person who carries an offensive weapon or dangerous article within the Declared Public Precinct is guilty of an offence which carries a maximum penalty of $10,000 or imprisonment for two years. The changes to the Summary Offences Act 1953 were enacted to maintain public safety and order in a defined area for which there is a reasonable likelihood of conduct in the area posing a risk to public safety and order and that the area is reasonable having regard to the identified risk. 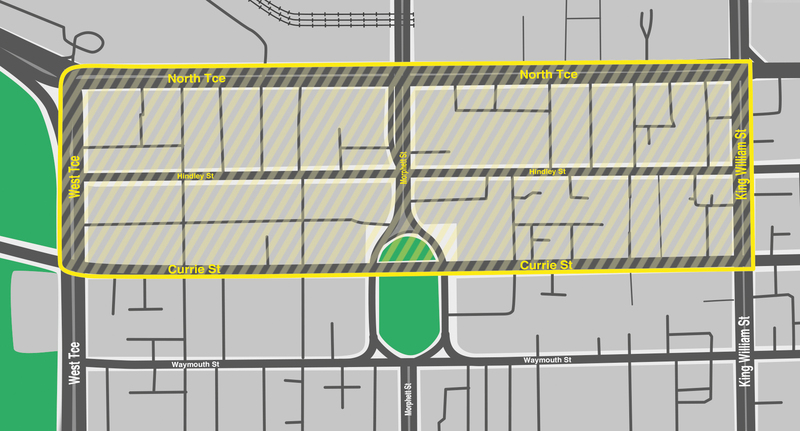 A ‘declared public precinct’ determination for the ‘City West’ area will significantly enhance the ability of SA Police to appropriately manage conduct that poses a risk to public safety and order for members of the community using this area.